Gutter cleaning is our main focus, but while we are up on your roof cleaning out the gutters we perform a 10 point roof and gutter inspection. 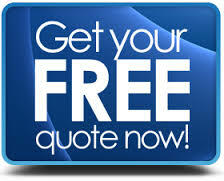 We have the tools, materials, and know-how to take care of most minor gutter repairs and roof repairs. Our gutter cleaning crews are three-man, highly-trained, professional teams. The entire gutter cleaning is done from the roof. We do this for a couple of reasons. First of all, moving a ladder around the house can be dangerous, damage landscaping, and it is not an efficient way to clean the gutters. Also, getting on the roof allows us to blow off any debris that has collected in roof valleys, makes checking the downspouts easier and gives us a complete view of what is in the gutters so we can make sure we are cleaning the gutters thoroughly. We do use ladders to gain access to the roof, and on steep-pitched roofs, our gutter cleaning teams use a rope and harness belay technique for safety. It’s the same equipment used for rock climbing, but rest assured, nothing is attached to your roof. All debris is blown off the roof and then the gutters are cleaned using a combination of hand-cleaning and blowers to make sure everything is removed from the gutters. At each downspout opening, we check the downspout for clogs using the blowers to force air through the downspout. This technique immediately tells us if the downspout is clear or has a clog in it. If a clog is found, we normally will dismantle the downspout remove the clog and put the downspout back together securely. 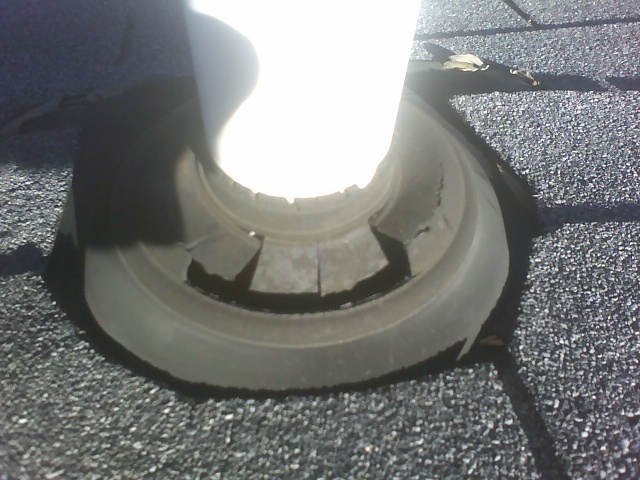 Once the gutter cleaning is completed from the roof, we will proceed to clean up on the ground. In most circumstances, we will blow the debris that is scattered around the house into natural areas on the property. We understand that sometimes this is not feasible depending on your property, so we can bag all debris and leave it curbside for a small additional charge. Our goal is that you do not notice that we have been there. Once we leave your property all the debris will be removed from the gutters and downspouts and your landscaping will be neat and tidy. 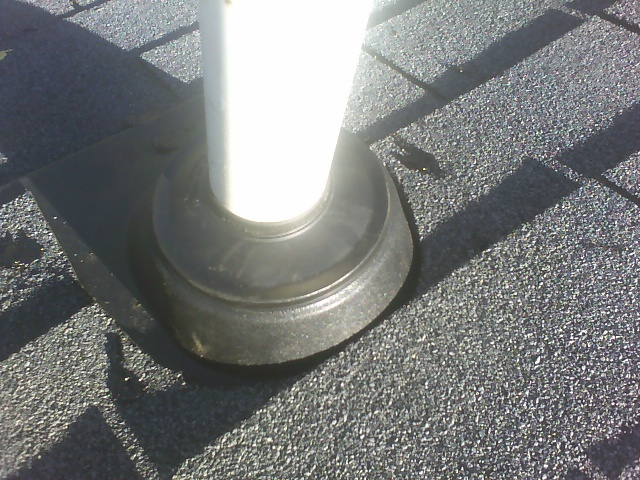 This is the most common gutter repair that we come across while gutter cleaning. 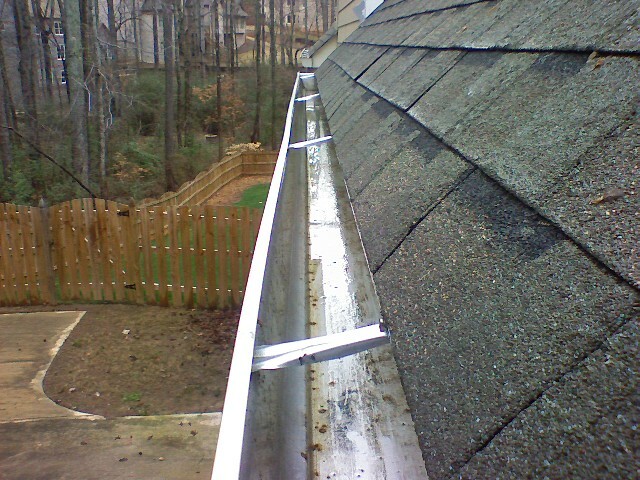 Typically, gutters are installed by nailing them to the house. 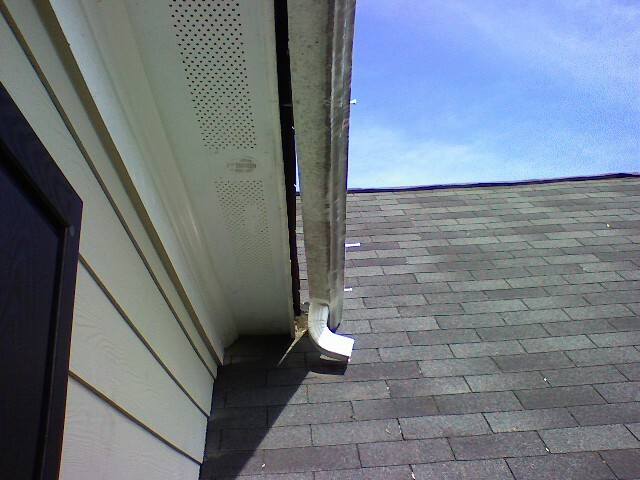 A long spike goes through the outside lip of the gutter, through the back of the gutter and into the fascia board which is attached to the rafters that make up the roof support. Over time these gutter nails will expand and contract with varying weather conditions and will work themselves loose from the fascia board. As this process continues over time, the gutter will eventually start to pull loose from the house resulting in the gutters sagging in areas. 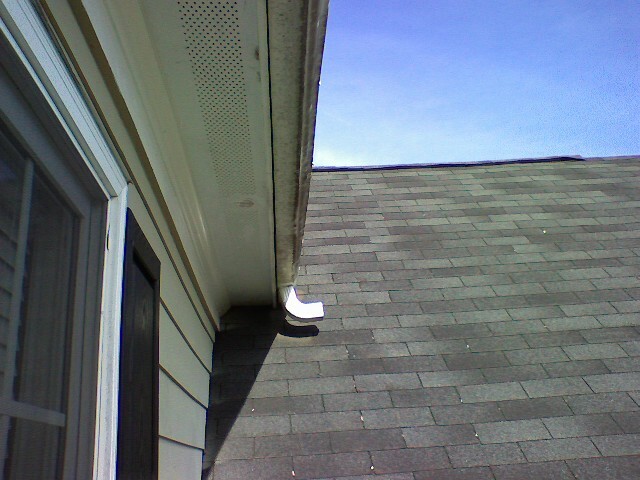 Of course, as water runs off the roof it will collect in the sagging areas instead of making its way to the downspouts. 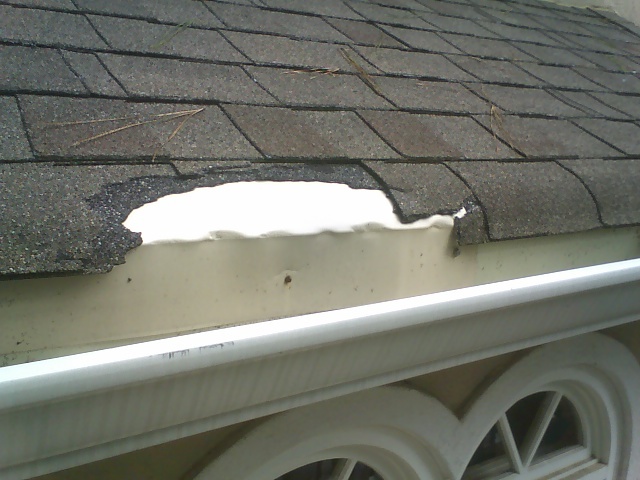 This causes the gutter to overflow in the sagging areas leading to wood rot, fascia and soffit damage, landscape erosion, water in basements, and in some cases, water coming into the house and causing sheetrock damage and water spots on ceilings and walls. We repair these gutters by installing additional gutter hardware which reattach the gutters securely back to the house in a permanent fashion. 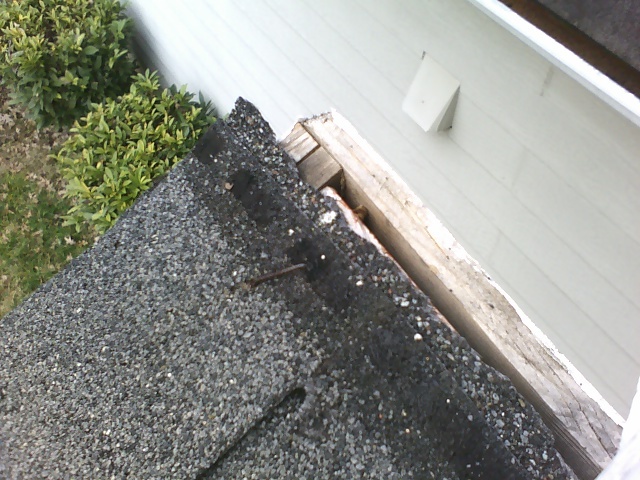 First, we will tap the existing gutter nails back into place. This is done to help us maintain the original slope of the gutter so that when we add the supporting hardware the gutters should drain properly as long as they were installed correctly. Next, we start on one end of the gutter section and add 7 inch coarsely threaded gutter screws along the entire length of the gutter. Once completed, the gutter is securely attached back to the house and since we use heavy duty screws instead of nails, the gutter is permanently attached because the screws cannot back-out like the nails can. Roof shingles sliding out of place, partial tabs of shingles breaking off, or entire shingles coming off completely is a common part of the normal aging process of your roof. Under ideal conditions, none of these things should happen very often, but conditions are never ideal. You may have some shingles that only got 2 nails in them when they were installed, inadequate roof ventilation, storms and high winds will blow shingles up and break off tabs, dramatic 24 hr changes in temperature can cause cracks and splits, and general aging will cause shingles to become brittle making all problems worse. While performing the gutter cleaning we get a birds-eye view of your roof and we are looking for all these problems mentioned above. We believe that our regular gutter cleaning service and inspection will help you to head off potential roof problems that might otherwise go unnoticed. All our crews are certified MSA’s and are able to replace any damaged or missing shingles at a fraction of the cost of having a separate roofing company come out for the repairs. We point out potential problems and keep you from spending a fortune on water damage repairs. 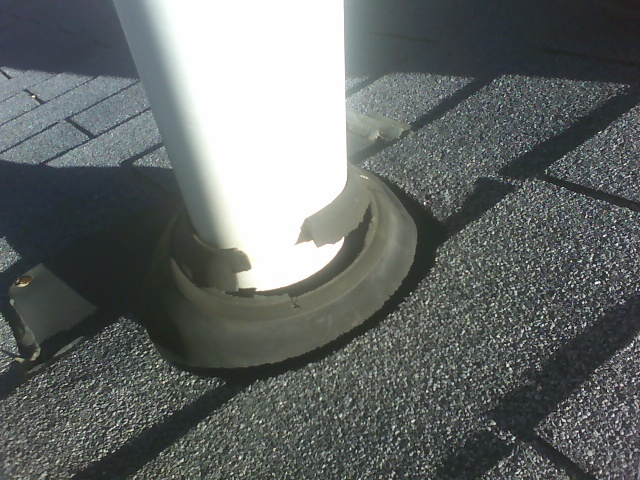 A common problem we see while performing a gutter cleaning is dry-rotted vent pipe boot flashing. In your house there are PVC (sometimes metal) vent pipes that run through the walls of the house, into the attic and extend out of the roof. These pipes serve several purposes, but the main thing we are concerned with is the flashing at the roof surface that keeps water from entering the house around the pipes. The average life for the vent pipe boots is about 7 years. Depending on weather conditions and how much sun each boot receives, the lifespan will vary. 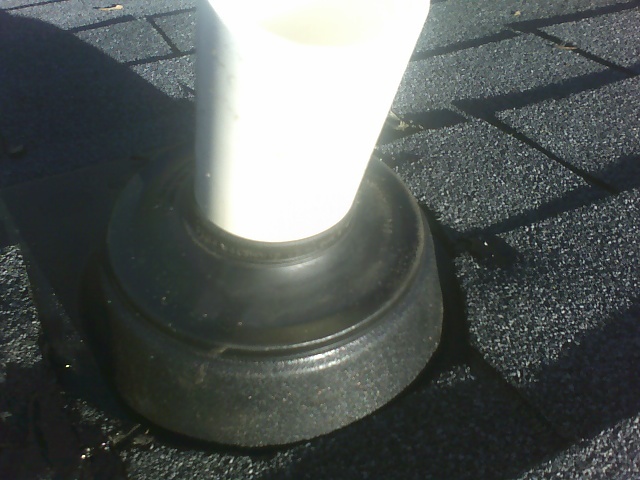 Eventually, the rubber seal on the boot that makes the watertight seal against the pipe will dry-rot and disintegrate allowing water to drip down the pipe into the attic or walls of your home. We remove the old boot, inspect the shingles around the boot to make sure they are still in good shape, replace any shingles if necessary, install the new boot, and seal the area appropriately. Many times we will see houses that have tree branches touching the roof of the house or closely hanging over the roof and gutters. These branches can tear apart shingles as they blow in the wind and they will constantly dump leaves and debris into the gutters. 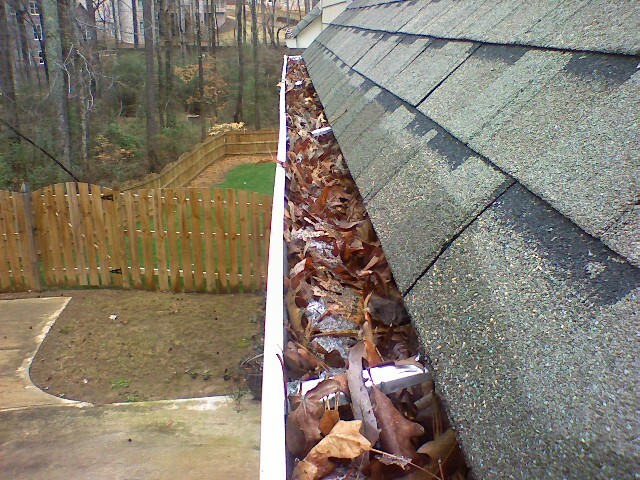 A gutter with a large tree hanging closely over it will tend to fill up with debris as soon as a month after a gutter cleaning, causing it to overflow, and problems ensue shortly thereafter. We carry 12 ft pole saws on our trucks. Basically, we get on the roof with the pole saw and trim back the branches approximately 8 ft from the roof horizontally and 8 ft vertically above the roof. This will save you a lot of hassle over the years and help keep your gutters clean and working properly.